A neutered, “controlled Left/Progressive” opposition is a necessary adjunct to the prevailing neocon ideology. If we are to be effective, rather than complicit opposition, the Canadian and U.S. governments need to be exposed as the international rogue states that they are. The controlled-Left “enablers” are experts at denying, negating, and obscuring foundational issues. The neutered Left might ostensibly oppose imperialism and the commission of supreme international war crimes, but if its opposition is rooted in elements of the Big Lie, then it inadvertently helps to advance prevailing neocon rogue elements. The Big Liars insist that wars of aggression and threatened wars of aggression are based upon humanitarian concerns, freedom and democracy, and/or a war on terror. All of these pretexts are empty vessels, evidence-free, ridiculous, yet the controlled Left maintains the illusion in its opposition, and in so doing provides cover for the foundational lie. When seemingly progressive politicians reinforce the “humanitarian” war propaganda lies, they enable the neocon warmongers by creating a false sense of opposition and “democratic” discourse. Humanitarian lies fabricate consent, and therefore provide a useful service to all warmongers. Criminal wars of aggression are bipartisan. Evidence-based reality inverts Rep Omar’s war lies. 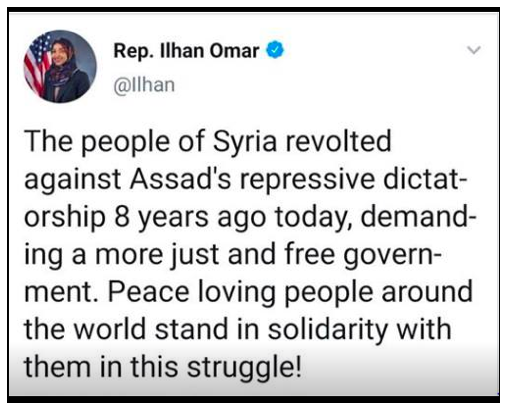 In fact, the CIA and assorted “intelligence agencies” displaced peaceful protests 8 years ago in a Regime Change operation aiming to destroy the overwhelmingly popular, democratically-elected government led by President Assad. 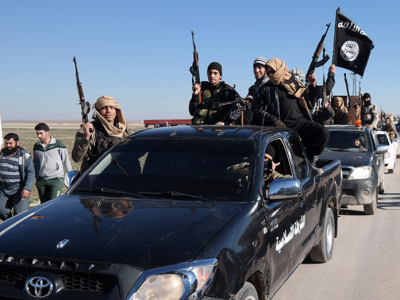 In fact, terrorist-supporting people from around the world — including the Canadian government — stand in solidarity with the struggles of ISIS and al Qaeda. Everything that the Canadian government does and does not do in foreign policy is anti-democratic, anti-feminism, anti-homosexuality, anti-all human rights. The Syrian government, for example, is secular and pluralist, but that is exactly what Trudeau and the Canadian government are destroying in favour of Wahhabi sectarianism where women have no rights and all human rights are obliterated. If the Trudeau government supported human rights and humanitarian concerns abroad, it would be supporting the Assad government, the Maduro government, legitimate governments in Kiev, and Libya, and Iraq etc. and it would oppose criminal wars of aggression. But it does not. Instead, the Canadian government and its agencies are exploiting human rights issues so that they can better perpetrate supreme international war crimes against humanity in foreign countries. A seemingly bruised and battered permanent war policy is strengthened when it is perceived to have withstood the rigours of “democratic” opposition. We need to generate an effective, legitimate opposition, by countering the war lies – all of them — with the truth. Stephen Sahiounie, “The day before Deraa: How the war broke out in Syria.” American Herald Tribune, 10 August, 2016. 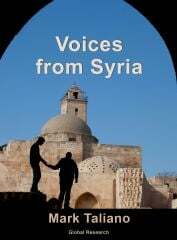 (https://ahtribune.com/world/north-africa-south-west-asia/syria-crisis/1135-day-before-deraa.html) Accessed 24 March, 2019.